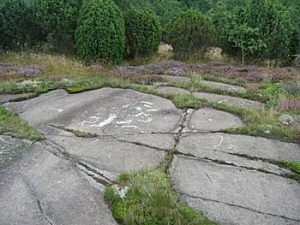 On Torhamnslandet are Blekinges largest rock carving. This is called Horse Hall or Horsahallen found in Möckleryd. Here there are about 140 pieces of engraved images from the Bronze Age which has been dated to 1500-500 BC The hall is named after two carved horse pictures. There are approximately 80 pieces ship pictures and carvings, footprint and smaller figures of different kinds. In Svanhalla on the east side also has a smaller carvings.